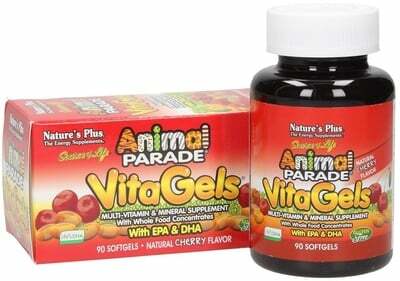 Animal Parade VitaGels is an award winning multi-vitamin and mineral whose composition is specifically tailored to the needs of children. It provides the essential omega-3 fatty acids DHA and EPA along with 22 vitamins and minerals and 14 whole-food concentrates of fruits and vegetables, including spirulina, carrot, broccoli, brown rice and spinach. 100% natural products with quality guarantees independent laboratories. Take 2 softgels once daily.